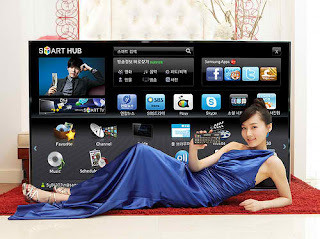 Samsung has announced that it will begin sending TV mainstay with the size of the Samsung D9500 super-sized 75-inches. Samsung offers the largest consumer 3D television on the market and the premium features Samsung's LED-backlit LCD Panels Black Diamond. TV Samsung D9500 is classified Smart TV so emang really smart to include a variety of applications such as Skype, Facebook, Twitter and Web browser to make it a family entertainment center in the living room. Browsing the web on TV is made much easier because of the QWERTY remote, which also allows users to quickly navigate through menus, as well as easy to type and search for web address. In addition guedhe screen size, this TV also has a high frequency for the appearance of 240Hz LED Backlight type.